Some say that the first impression of a website is based on the quality of the website’s design. In the competitive world of web design, crafting a website that is visually appealing, user-friendly and memorable is an uphill task for web designers. A great website requires thorough research, planning and background work to stand out. From gathering information, to creating content, and keeping your site updated – the web design process has many steps that can be broken down into easy manageable phases. Web design milestones need to be reinforced with timelines that are realistic and doable. To-do lists may seem elementary at first, but they’re essential for breaking down milestones into easier, more workable chunks. This step entails meeting the client and gathering information. It is extremely crucial since it requires the designer to understand the client’s requirements, company, goals and target audience. Designers should ask questions and understand what the client wants perfectly. 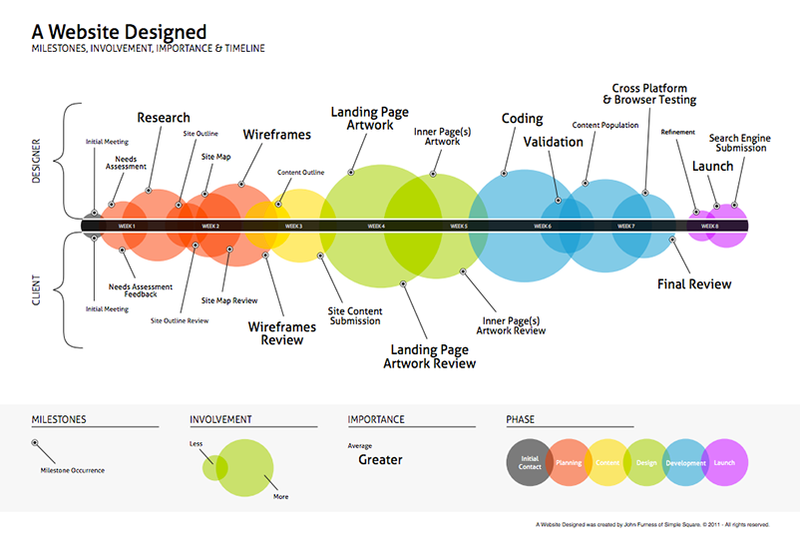 This will help save a lot of time and work during the website design process. Designers may also have the client complete a quick survey so that you can gather more details about their vision. The planning stage is another important one on the ladder, because what’s decided and mapped here sets the milestones and timeline for the entire web design project. This is also the stage that requires client interaction and the accompanying attention to detail. In this phase, designers create the site-map and make sure that the client has reviewed and approved them. As soon as the site-map for the new site is finalised, designers may decide which technologies to use and than design wireframes. At the heart of every website lies its content. It is what hooks your users and keeps them coming back for more. Keeping your content focused, interesting, informative and useful will all add to its allure. The timeline for this phase varies greatly depending on the number of pages and if the client is prompt with providing the web designer all of the content for the site. If the client is not prompt with providing all content for the pages, that will slow down the whole website design process. When the visual design cycle starts, the designer uses the content and wireframes to design pixel perfect mockups for the client. Once the client has had a chance to look over the initial designs, he has the opportunity to provide feedback or request changes. Then designer continues the process of fine tuning the design until he has the client’s approval. In this phase, designers should create a demo installation, so that the client may view and interact with the web pages as they are being developed. In this phase, designers should run through a final set of tests to be sure that everything is functional. As soon as the site has been tested, reviewed and approved by all those involved in the project, it’s time to launch the website for the viewing public. Once you launch the site, monitor it for user feedback and make adjustments accordingly. Always remember, that a website is a fluid medium that changes all the time. It is extremely important to keep it up-to-date and maintained. If you’re looking for some inspiration to boost your next web design project, here you can find 15 remarkable digital agency website designs from around the world.